Most cancer patients will require radiation therapy at some stage during their disease. Among all radiation treatments, 30%–50% of treatments are palliative., For palliative treatments, radiation therapy is a locally effective tool, with little to no systemic side effects and mostly mild acute side effects. Furthermore, radiotherapy is important for oncological emergency procedures, such as treatment of obstructions, tumor bleeding, and spinal cord compression. Dedicated rapid access palliative radiation therapy improves patients' access to care and quality of life. TomoTherapy is a ring gantry-based radiotherapy treatment system that is also capable of producing high-quality megavoltage fan-beam computed tomography (MV FBCT) images for setup verification. TomoTherapy have created a module called “statRT (Accuray, Sunnyvale, CA)” that allows these MV CT images to be used for treatment planning. This module has the benefit of allowing simulation, treatment planning, and treatment to be carried out in a single-visit taking <1 h in total, which in turn minimizes the time to treatment and movement required by patients, which is particularly beneficial for urgent palliative patients who are typically in considerable pain. In fact if patient-specific quality assurance (QA) is performed using calculation based methods, and sufficient time is available on the machine, the simulation, and treatment can actually be performed in a single setup rather than move the patient off the bed for the time required for planning  and later put him/her back on the bed. Thus far, research has focused on whether the statRT functionality gives comparable plans to the conventional planning method.,, However, relatively little research has systematically verified the image quality of MV CT images against accepted planning CT standards (AAPM TG 66), particularly since the significant changes to the image reconstruction algorithm introduced in the TomoTherapy HDA system (H series v2.0, Accuray, Sunnyvale, CA). The MV CT on TomoTherapy is a spiral CT using 3.5 MV X-rays from the therapeutic linear accelerator and detected with a xenon gas ion chamber array. The MV CT uses a 512 × 512 matrix in a field of view (FOV) of 40 cm resulting in a pixel resolution of 0.78 mm. Fine, normal or coarse slice thicknesses can be selected, which correspond to a couch travel speed of 4, 8, and 12 mm per rotation during imaging. Depending on the selected slice thickness, a reconstruction interval of 1 or 2 mm for fine slices, 2 or 4 mm for normal slices, or 3 or 6 mm for coarse slices can be selected. Time required for one rotation during the CT scan is 10 s. Compared to MV cone beam CT (MV CBCT), MV FBCT uses a thin fan-beam instead of a wide cone beam and acquires images slice by slice. It provides the advantage that scattered X-rays do not contribute as significantly as in MV CBCT and thus results in better image quality. The aim of this study is to assess the quality of the MV CT images provided by TomoTherapy against accepted planning CT standards to see if MV CT can be used directly for planning with the statRT module, so that radiotherapy patients' simulation, planning, and first-day treatment can be completed all in one visit on the TomoTherapy Unit, allowing the patients to have accurate, and yet rapid-access palliative radiotherapy treatment to improve their quality of life. A well-established CT simulation process should be able to provide spatial information for patient positioning and immobilization as well as anatomical information for contouring and dose calculation. If TomoTherapy MV FBCT was to be used for dose calculation, then it can be argued that the same scope of QA tests that apply to a kV CT scanner should be applied to TomoTherapy. AAPM TG 66 has a recommended list for CT QA. As for TomoTherapy, the imaging system and the treatment delivery system share the same gantry and laser systems. Some of the listed check items are already included in the linear accelerator's regular QA programs, such as QA on couch motion and gantry rotation. Apart from these tests, the following QA measures were added to test TomoTherapy's capacity for radiation therapy planning. Those QA tests were also repeated on the kV CT scanner currently used for clinical planning to provide a reference for comparison. In this study, all kV CT scans were acquired on a GE Discovery PET-CT scanner (GE Healthcare, Little Chalfont, United Kingdom) with 120 kV X-ray at 440 mA and a reconstruction interval of 2.5 mm at a large FOV. All MV CT scans were acquired on TomoTherapy HDA v2.0 with 3.5 MV X-ray and normal slice thickness and a reconstruction interval of 2.0 mm at an FOV of 40 cm. TomoTherapy does not have a gantry laser system and only uses a wall-mounted laser system. Its alignment and orientation with respect to the imaging plane must be checked. In this test, the TomoTherapy phantom, or “cheese” phantom, was used. The geometric center of the phantom was aligned to the lasers and then scanned using the MV CT system. The position of the scanned center of the phantom was then compared to the imaging center as indicated by the software to ensure laser-imaging coincidence. The geometric accuracy of the system was tested by checking the distance between two known points on a phantom. In this test, the CATPHAN 500 imaging phantom (The Phantom Laboratory, Greenwich, New York, USA), whose three dimensions were physically measured, was used. 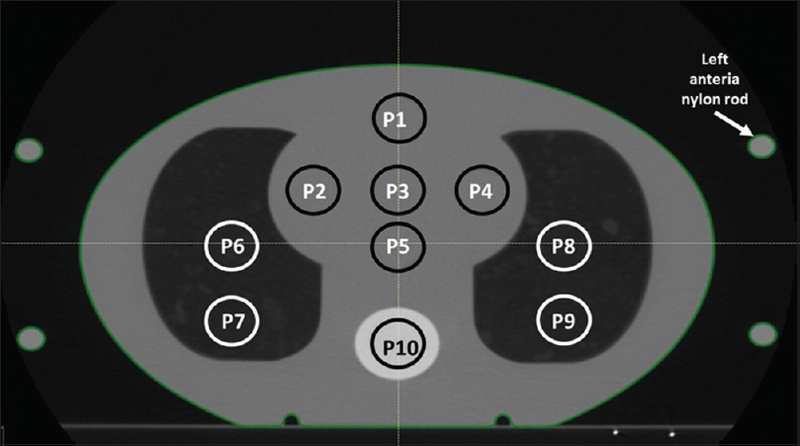 The phantom was scanned on both kV CT and MV CT, with the three dimensions of the scanned phantom measured and compared to the physically measured values. The difference was expected to be within 1.0 mm. The average and the SD HU were then used to assess the field uniformity and the noise of both systems. The SD was estimated because it was not given by the RTPS and would take the authors too long to manually collect enough sample data to calculate it. The spatial resolution of both imaging systems was assessed using the image resolution section in CATPHAN. This section of the CATPHAN contained a 1 through 21 line-pair per centimeter high-resolution test gauge and two impulse sources which were cast into a uniform material. The number of visible pairs of lines was recorded for each imaging system to compare the resolution. TomoTherapy treatment planning system (TPS) converts CT number to mass density (MD) to calculate dose. A CT-ED phantom with density plugs of known physical densities was used to generate CT-MD tables for both systems. The resultant CT-MD curves for both imaging systems were compared to see if a linear relationship can be established between the CT number (in HU) and the MD (g/cm 3) for dose calculation. 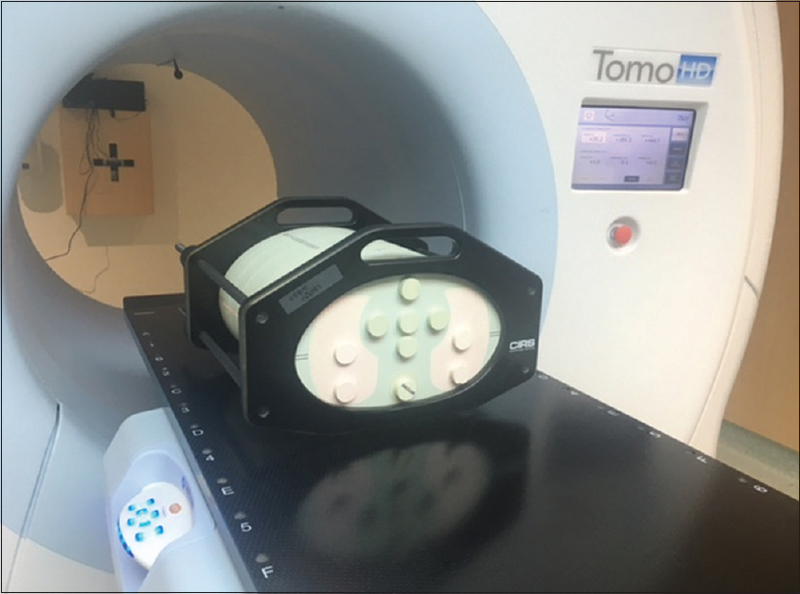 After the calibration curves were established, to ensure that the CT-MD calibration stayed valid for dose calculations, a simplified QA program, utilizing the TomoTherapy phantom, or the “cheese” phantom, was implemented. The cheese phantom, with a lung and a bone insert replacing the water inserts, was scanned on a regular basis. After scanning, the density of the lung, bone, and water inserts was recorded in the planning system and compared to the baseline data, whose difference was expected to be within 2.0%. The results for this constancy check would not be listed in this study. An end-to-end measurement provides a direct method to quantify the potential errors in the procedure. The end-to-end measurement should be designed such that it simulates real treatment. For this reason, the authors performed end-to-end tests in the Computerized Imaging Reference Systems (CIRS) upper thorax phantom, as it provides multiple measurement positions and areas of inhomogeneity. A calibrated farmer chamber was used for chamber measurement. The CIRS thorax phantom was established according to the same setup used for Australian Clinical Dosimetry Service level III audits  as shown in [Figure 1] and [Figure 2]. The CIRS phantom was scanned both with the kV CT and the MV CT and saved as different QA phantoms in the TomoTherapy planning system for future calculations. Araki reported that when a thin-walled cylindrical chamber was used for measurements in a heterogeneous phantom that includes solid water, lung, and bone plastic materials, for a 6 MV photon beam on a conventional linear accelerator, the perturbation factor introduced by the chamber due to the replacement of the air cavity, nonwater equivalence of the chamber wall, and the stem and nonair equivalence of the central electrode could be up to 2% and 3.5% for lung and bone, respectively, depending on the field size. This effect can be more significant for TomoTherapy because of the lack of electron equilibrium from the small segmented fields in TomoTherapy helical delivery mode. As a result, to reduce the chamber perturbation in the bone measurements, a water insert with chamber cavity was inserted in the bone cavity instead of the bone insert both in the measurement and in the TPS calculation. This is the same method applied in ARPANSA level III audits. A total of three complex TomoTherapy helical plans were chosen whose 50% isodose distributions covered several chamber cavities so that multiple measurements at different points were possible. These plans were copied and recalculated on both the MV CT and the kV CT scanned CIRS phantom. Although scanned by different CT modalities, the exact same isocenter position was used when recalculating the plan. As is shown in [Figure 2], 10 measurement points were available in the phantom. Points 1–5 sit in a homogeneous water density. Points 6–9 sit in a homogeneous lung density. Point 10 sits in a water density but is surrounded by a bone ring representing spine. Due to its large cavity, the farmer chamber was deemed unsuitable for measurement at areas with high-dose gradient. For this reason, with each plan, only some points were chosen as chamber measurement points depending on where the dose distribution was relatively homogeneous. The reading was converted to dose after corrections were applied. This dose reading was then compared to the predicted point doses calculated on the kV CT and the MV CT phantom. 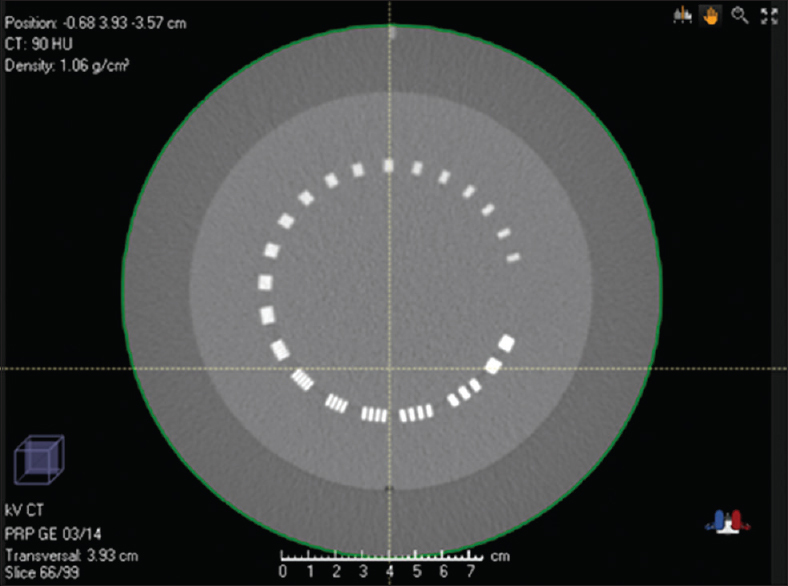 As a routine check of the dose calculation constancy, a plan was recalculated on an MV CT utilizing the adaptive planning module provided by TomoTherapy. The cheese phantom was scanned on the MV CT, and a predesigned QA plan was then recomputed on the MV scan in the adaptive module, whose resultant dose distributions were compared to the original plan computed on the same phantom scanned by the kV CT. The difference was expected to be within 2.0%. This test was relatively simple and provided neither inhomogeneity calculations nor direct detector measurement, but was efficient in quickly checking the dose calculation constancy of the MV CT. Its results were not listed in this study. [Table 1] lists the results of this part of the test. [Table 2] lists the results of this part of the test. [Table 3] lists the result for this part of the test. [Figure 3] and [Figure 4] show the screen capture of the CATPHAN uniformity section from both imaging systems. [Table 4] lists the result for this part of the test. [Figure 5] and [Figure 6] show the screen capture of the CATPHAN image resolution section from both imaging systems. 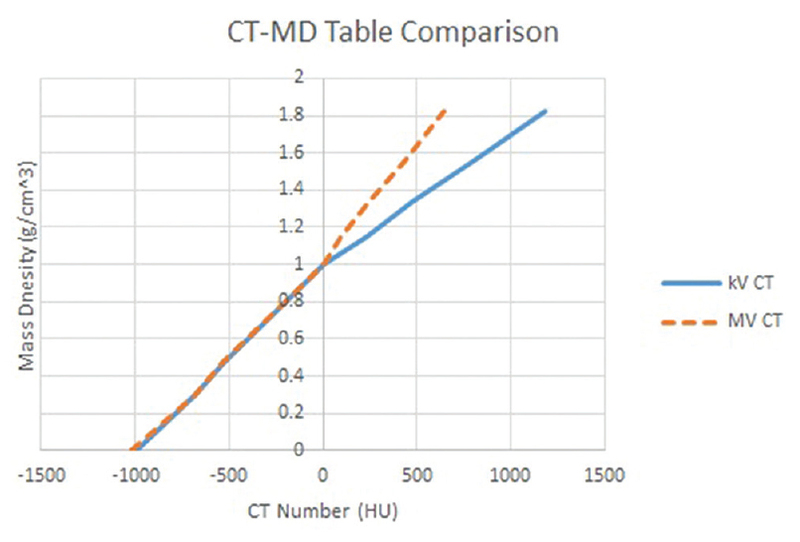 [Table 5] shows the results of CT-MD tables generated from the CT-ED phantom for kV CT and MV CT.
[Figure 7] shows the CT-MD curve for both imaging systems. [Table 6] lists the results for the end-to-end measurements. From [Table 1], it is noted that TomoTherapy's laser system aligns well with the MV CT imaging system to within 1.0 mm. As such the laser system can be used as guidance for patient positioning during the initial image acquisition. This alignment is checked on a regular basis. From [Table 2], it is noted that the detected dimensions from both imaging systems are within 1.0 mm of the physical dimensions. It indicated that geometric dimensions can be determined accurately from both imaging systems. The difference from the MV CT system was slightly higher but was of no statistical significance given the image pixel size, as the P value, when calculated by the N-1 Chi-square test, is more than 0.05 (0.0586). No obvious geometric distortions were observed from both image sets. The absorbed dose per photon emitted is much higher for MV than for kV and therefore to limit the imaging dose fewer photons are used in MV FBCT  compared to kV CT.
Large image noise could make both automatic and manual anatomy delineation difficult. Intra-imaging motion from the patient would further increase the noise level. From the results in this section, it is noted that the image resolution provided by MV CT is poorer compared to that from a conventional CT scanner. 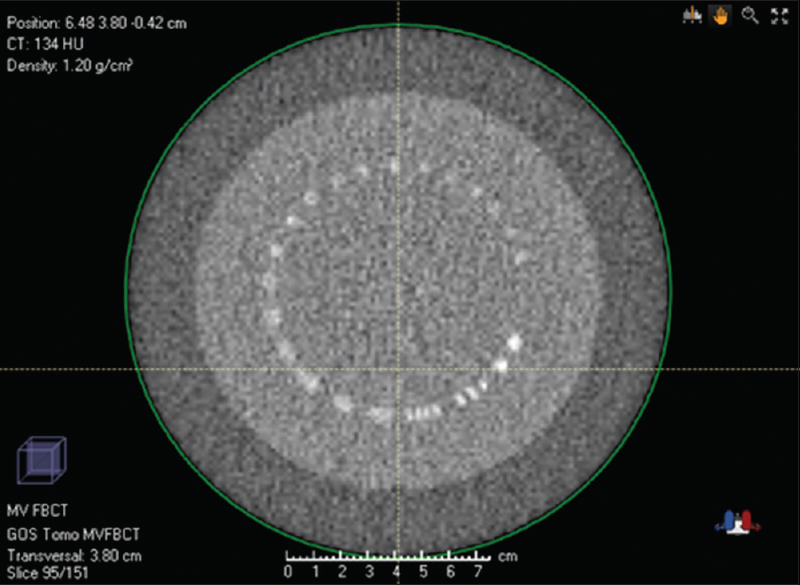 The poor spatial resolution alone would not reduce accuracy in dose calculation, but it would introduce difficulties in the delineation of targets and critical structures. As nowadays volume-based optimization is widely used in many commercial radiation planning systems such as the TomoTherapy planning station, accurate identification, and delineation of both the targets and the organs-at-risk are critical for optimal plan outcome. They are also important in the evaluation of the plan quality. The poor spatial resolution would consequently be likely to downgrade the plan accuracy and the plan quality, especially for those plans that use volume-based optimization. From [Figure 8], it was noted that for both kV CT and MV CT, the relationship between CT number and MD is linear, making it possible to establish a CT-MD curve for both scans to achieve dose calculation. Both curves are similar for materials with density equal to or lower than water (1.0 g/cm 3), but for materials with density higher than water, the difference between the curves is significant. Compared to kV CT, the part of the curve beyond water density from MV CT is sharper. 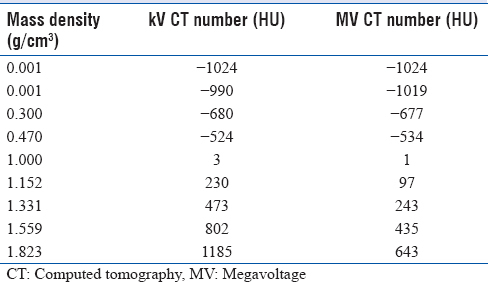 This indicates that the MV CTs would have a poorer contrast compared to kV CT, as the CT number difference for materials of different densities is smaller and thus more difficult to distinguish visually. This is because in the MeV photon energy range used in MV FBCT, Compton scattering effect is predominant in attenuating the beams, which is almost independent of the atomic number Z of the material. In contrast, in the keV range used in kV CT, the predominant interaction is the photoelectric effect, whose attenuation is highly dependent on the atomic number Z of the material. As a result, while both kV and MV CT depend on electron densities, kV CT tends to display sharper contrast in the visualization of materials with differing atomic numbers. At the same time, this also means MV CT produces less artifact and image distortion when high atomic number material is present within the scan. Note that this effect was not specifically due to materials having a density greater than water, but rather was because materials with density greater than water tend to have greater atomic number. From all the above results, it was noted that the largest problem with the MV FBCT was the large noise compared to kV CT, which resulted in uncertainties in target delineation. The noise could have larger impact on patients due to more complicated geometries and patient motion. MV CT also demonstrated a poorer spatial resolution and less contrast for materials of MD more than water, both of which would make accurate target delineation more difficult. As inverse planning optimization is fully based on structures, inaccuracy in target delineation can potentially degrade the plan quality. As a result, users should be cautious with the use of TomoTherapy MV CT as the primary image set in plans that use inverse planning technique. The results also indicate that for TomoTherapy MV CT an accurate CT-MD curve can be established for dose calculation and point doses calculated on both MV CT and kV CT agree well with the measured values, despite its relatively poor image quality due to high noise, low contrast, and low spatial resolution. The imaging system also provides accurate geometric measurements. As a consequence, the imaging system can be used for direct dose calculation in forward planning for areas with well-known structures, as long as proper commissioning tests are performed and proper QA systems are maintained. As such one suitable application of TomoTherapy MV CT is palliative radiation therapy treatment planning, where structure delineation is primarily determined from bony anatomy, and larger margins can be justified. All test results have indicated that adequate geometric and dosimetric information can be provided by the MV CT alone for these types of treatment. The use of TomoTherapy MV CT for palliative planning allows patients to gain rapid access to palliative radiation therapy with minimal patient movement required. Consequently, patients' access to quality care and an improved quality of life is made possible., The other advantage provided using TomoTherapy MV CT in conjunction with a TomoTherapy linear accelerator for palliative treatment is that as in this procedure; the patient is both scanned and treated on the same TomoTherapy couch, the accuracy in reproducing the patient's position from scanning to treatment delivery can be greatly improved. MV CT produces less artifact and image distortion when high atomic number material is present within the scan. As such it provides a significant advantage over kV CT for patients with high atomic number implants such as metal dental fillings or hip prosthesis. One example is given below, where the patient not only requires treatment around the lower lip but also has titanium dental fillings. The patient was scanned with both kV CT and MV CT, displayed in [Figure 8]. It is noted that there is no image artifact on the MV CT scan, but considerable streaking appears on the kV CT scan. The presence of artifacts requires density overrides to the areas affected by the artifact and also reduces the accuracy of structure delineation. For this reason, for patients with high atomic number implants, TomoTherapy MV CT can be acquired and used as the secondary image set, which can be fused to the kV CT images to aid target delineation, if not used directly as the primary image set for planning. One potential source of error that was not analyzed by the described tests was the imaging artifact caused by patient's intrafractional motion. Since the MVFB CT acquisition on TomoTherapy takes much longer than a kV CT, patient motion becomes a significant problem. One example is shown below in [Figure 9], where the artifact caused by patient's respiratory motion can be clearly observed. Although palliative treatments are most likely prescribed to patients with bone metastases, brain metastases, and spinal cord compression  which are relatively motionless anatomical sites compared to others such as lung and liver, the motion effect can still be significant with extended imaging acquisition time. This is more of a problem during initial image acquisition, as during treatment delivery patient motion can be accounted for by adding proper margin or overshoot in planning to account for organ motion. The study assessed whether TomoTherapy MV FBCT images have comparable image qualities to conventional kV CT images and can be used directly for radiotherapy planning. Despite its long image acquisition time and relatively large noise, the authors concluded that TomoTherapy MV CT images provide adequate information for the delineation and planning of palliative radiotherapy patients whose treatment sites are relatively immobile and well-distinguishable. As such, it can be used together with the statRT module provided by TomoTherapy for the simulation, planning, and treatment of palliative radiotherapy patients. For less-mobile palliative patients, it is possible to allow the patient to stay on the TomoTherapy couch from simulation until treatment, which minimizes the chance of doing damage to the patients and reduces reduced potential aggravating morbidity pain during bed transfer. The pretreatment QA for these patients can be performed with QA programs that are based on calculations and do not require direct dose measurements. As a result, it is feasible to use the TomoTherapy unit for the simulation, planning, and treatment of palliative radiotherapy patients. Once TomoTherapy planning is available in an open-source planning system, the workflow can be further optimized through the implementation of scripting and automation in steps such as image transfers, contouring, plan setup and plan check, so that the turnaround time for the patient can be further reduced, thus further improving patient quality of life. van Oorschot B, Rades D, Schulze W, Beckmann G, Feyer P. Palliative radiotherapy – New approaches. Semin Oncol 2011;38:443-9. Mackillop WJ, Kong W. Estimating the need for palliative radiation therapy: A benchmarking approach. Int J Radiat Oncol Biol Phys 2016;94:51-9. Dennis K, Linden K, Balboni T, Chow E. Rapid access palliative radiation therapy programs: An efficient model of care. Future Oncol 2015;11:2417-26. Rong Y, Yadav P, Paliwal B, Shang L, Welsh JS. A planning study for palliative spine treatment using StatRT and megavoltage CT simulation. J Appl Clin Med Phys 2010;12:3348. McIntosh A, Dunlap N, Sheng K, Geezey C, Turner B, Blackhall L, et al. Helical tomotherapy-based STAT RT: Dosimetric evaluation for clinical implementation of a rapid radiation palliation program. Med Dosim 2010;35:280-6. Dunlap N, McIntosh A, Sheng K, Yang W, Turner B, Shoushtari A, et al. Helical tomotherapy-based STAT stereotactic body radiation therapy: Dosimetric evaluation for a real-time SBRT treatment planning and delivery program. Med Dosim 2010;35:312-9. Mutic S, Palta JR, Butker EK, Das IJ, Huq MS, Loo LN, et al. Quality assurance for computed-tomography simulators and the computed-tomography-simulation process: Report of the AAPM Radiation Therapy Committee Task Group No 66. Med Phys 2003;30:2762-92. TomoTherapy Incorporated. MVCT imaging with J1 TomoImage beam. Application Note for the Tomotherapy Hiart Treatment System. TomoTherapy Incorporated; 2010. Sterzing F, Kalz J, Sroka-Perez G, Schubert K, Bischof M, Roder F, et al. Megavoltage CT in helical tomotherapy – Clinical advantages and limitations of special physical characteristics. Technol Cancer Res Treat 2009;8:343-52. Yang C, Liu T, Jennelle RL, Ryu JK, Vijayakumar S, Purdy JA, et al. Utility of megavoltage fan-beam CT for treatment planning in a head-and-neck cancer patient with extensive dental fillings undergoing helical tomotherapy. Med Dosim 2010;35:108-14. Meeks SL, Harmon JF Jr., Langen KM, Willoughby TR, Wagner TH, Kupelian PA. Performance characterization of megavoltage computed tomography imaging on a helical tomotherapy unit. Med Phys 2005;32:2673-81. Langen KM, Meeks SL, Poole DO, Wagner TH, Willoughby TR, Kupelian PA, et al. The use of megavoltage CT (MVCT) images for dose recomputations. Phys Med Biol 2005;50:4259-76. Held M, Cremers F, Sneed PK, Braunstein S, Fogh SE, Nakamura J, et al. Assessment of image quality and dose calculation accuracy on kV CBCT, MV CBCT, and MV CT images for urgent palliative radiotherapy treatments. J Appl Clin Med Phys 2016;17:279-90. Australian Clinical Dosimetry Service. Instructions for the ACDS level III audit: Wedged and Asymmetric fields with Inhomogeneities for Lung treatments (WAIL). Int ACDS Rep 2014. Araki F. Monte Carlo-based correction factors for ion chamber dosimetry in heterogeneous phantoms for megavoltage photon beams. Phys Med Biol 2012;57:7615-27. Karl P. On the criterion that a given system of deviations from the probable in the case of a correlated system of variables is such that it can be reasonably supposed to have arisen from random sampling. Philos Mag Ser 5 1900;50:157-75. Khan FM. The Physics of Radiation Therapy. 3rd ed. Baltimore: Williams & Wilkins; 2003. p. 67. Yeo R, Campbell T, Fairchild A. Is weekend radiation therapy always justified. J Med Imaging Radiat Sci 2012;43:3-24. Squires M, Hu Y, Byrne M, Archibald-Heeren B, Cheers S, Bosco B, et al. Static beam tomotherapy as an optimisation method in whole-breast radiation therapy (WBRT). J Med Radiat Sci 2017;6:1-9.